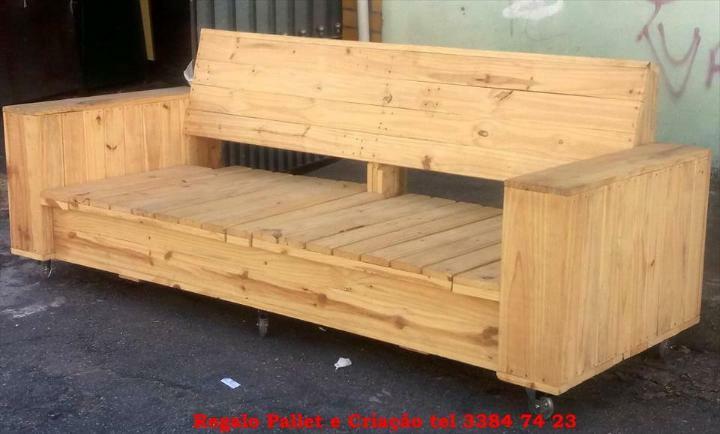 Pallet slats can be put together and packed for any custom construction of a selected furniture piece, filling of pallet slats can be too much also and here we are one thing more to double up your fun! 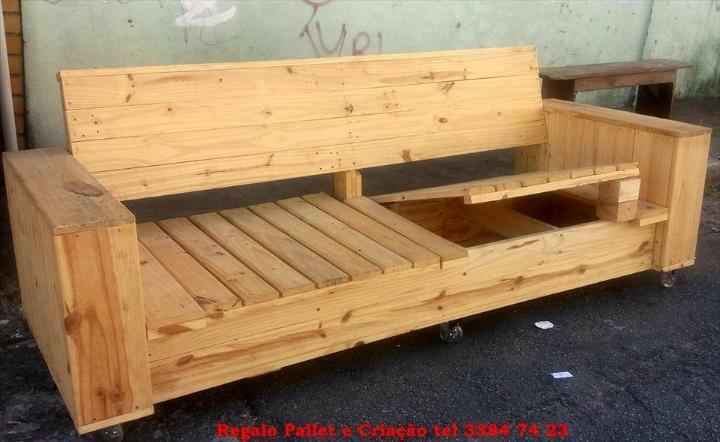 Go with precise and neat filing of pallets and gain this DIY wood pallet sofa or bench frame on 6 wheels as a lovely output! 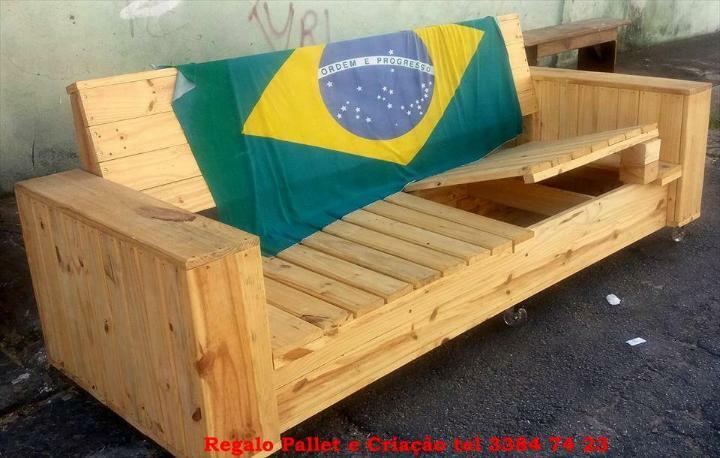 The lower frame of it is just like a toddler bed, has raised block style sides to serve as armrests of sofa! The berth position here has been wished here to be storage-friendly, so berth can be opened up to see the secret storage compartments build in the pallet sofa for any custom type of storage! Here backrest has been built separately and stands on a single but sturdy wooden post that has been perfect settled down to lower frame! 6 Caster wheels have been selected here to move easily the giant size of this wooden bench! 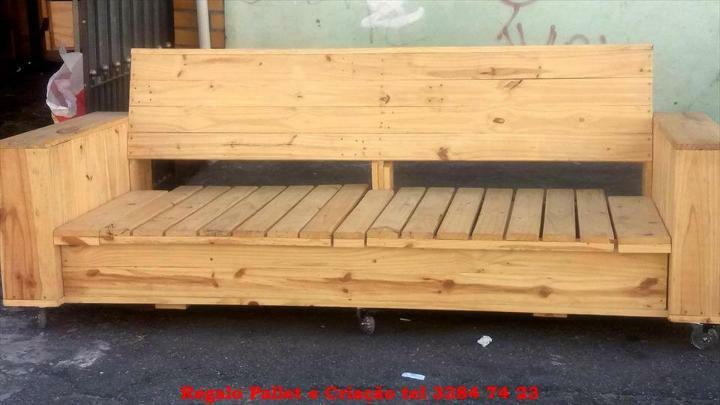 Nicely filled solid look and block style design ensure a very long life of this beefy pallet sofa frame, can also be dragged to your green space or patio as a bench! It provides storage facility in the seat, the berth potions can be lifted up to reveal the secret compartments built-in at any time you need to store something inside the bench! For easy and fast anywhere movements, 6 caster wheels have been installed that help this bench drag effortlessly to either direction you want! Make the berth section upholstered or put a thick mattress foam cushion over to let it make your feel super soft and warm while are you sitting on it!